Over the last couple weeks, we have been hard at work adding beautiful reclaimed materials to both the exterior and the interior. Board and batten reclaimed from an 1830's whiskey refinery in Rumsey, Kentucky went up on the outside and was painted a traditional bright white. On the interior, gorgeous reclaimed wood floors were installed. Each piece of the floor was hand-selected from various Texas farmhouses and a Texas Panhandle church. We couldn't be more excited about how they turned out. Beautiful bead board reclaimed from those same Texas farmhouses and the Texas Panhandle church now covers the ceilings. The variation of the wood is perfect, and adds such character and a unique look to the space. The Little House is coming together and we are so excited about the direction and shape it is taking. We have partnered with several local companies which has allowed us to select some amazing interior items. Here's a look at the build process so far, and how we have come. The first wall of The Little House goes up! It begins taking the classic farmhouse shape with each additional wall. The pitched gable roof is up. Our artisans work hard to ensure every detail is just right. Board and batten from an old whiskey refinery in Kentucky goes up on the outer walls. The interior of the home begins to take shape. This will soon be a stunning kitchen. Shiplap covers the bedroom walls. Bead board from old Texas porches and a Texas Panhandle church covers the ceilings. So much history in this place. We have finished selecting all of the interior finishes including light fixtures and faucets. We are going with a clean black, white and natural palette with touches of brass and natural wood. The mood board below really shows the direction in which our creative vision for The Little House is going. A very special thanks to all of our partners on the project including Ferguson, Clay Imports here in Austin, Texas, Delta, American Standard, Kitchen Aide, LG, Bosch, Daikin, East Side Environmental Air, and RAM windows. Reclaimed Space has built some great projects and spec homes. They have all been an expression of sustainability – modern meeting rustic. All of our past specs have also been similar in look and feel. Traditionally, our spaces are recognizable by the materials in which they are clad, and the single pitch roof shape and design. In partnership with Stone & Acre Real Estate, we are building something different – a modern, white farmhouse. I have always admired this type of structure, but until now we haven’t been able to transport this type of space. With the help of a trusted transporter and their custom trailer that will allow for the extra height and not restrict road and bridge accessibility, our longtime dream of crafting a Texas farmhouse is finally coming to fruition. I could not be more excited about this project, and its signature tall, gable roof. We have named the space “The Little House”. The Little House came about because of the two companies coming together as one, and our combined interest in building a farmhouse that is modular, custom, prefabricated, and full of thought and character. I have designed and built spaces for all settings, climates, purposes, and for certain budgets and style preferences. I have also spent a lot of time driving back roads looking for barns and farm homes to reclaim. The time spent on the road has given me plenty of time to think about the perfect farmhouse. The Little House design is based upon a time tested Texan frontiersman styled home. This is our first project that is not single-roof-pitched inspired. Instead, it is a beautiful, gabled roof farmhouse design. The gabled roof allows us to have a sleeping loft. Reclaimed Space has typically built the single pitched roof spaces to an overall height of 12'2" for easier transportation. This height allows for only 3' of a loft against a wall. 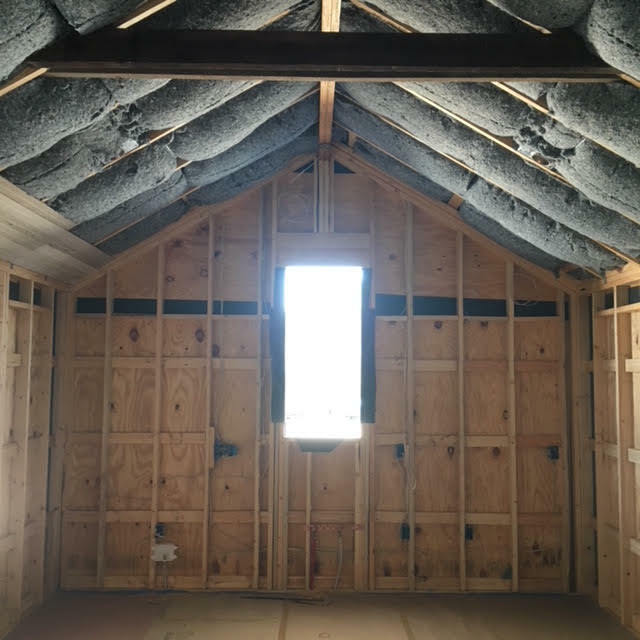 With our new, 1'6" taller, gabled roof, we have 4'6" of clearance in the middle of the room slopping to the exterior walls. While it is not enough height to stand up in, it is plenty for little ones to use for a sleeping area. The Little House will have a loft that is large enough for 4 twin mattresses or two queens. Historically, the loft was where everyone slept at night, and in particularly, in the winter. The stove would keep the loft warm and cozy, and the elevated space kept the beds out of traffic areas. The ceiling in our farmhouse vaults to the middle, centering the space, and will give a great sense of height. We will cover the ceiling with white bead-board we have been saving for a special build. It was salvaged from a 1920's church we deconstructed in the Texas panhandle near Oklahoma. During the frontier days, the tall narrow windows were affordable and brought a lot of light into the home before electricity. They also served as a place for the cool to come through and cross ventilate. When the home warms up you can open the loft window to release the captured heat and the kitchen and living room windows to draw in the cool air. The Little House features a southern facing porch. It will be cooler in Texas from our prevailing south-east breezes, and the home will protect you from the chilling northern winter breezes. An 8' porch is the right distance to shade from the summer heat, keep the southern wall cooler, and allow the sun to enter and warm the porch as the sun's azimuth in the winter. Functionally, The Little House will have everything you would need for an extended weekend with friends and/or family. It will have full size appliances with ample counter top space, a dining area, ample living space and a large bathroom. All this in a 14'x32', 448 square foot space. It will sleep in a queen bed, up to four in the loft, two on a sleeper sofa, and potentially two more on an air mattress. Heck, if you really wanted to, let them sleep on the porch. Many of our clients thought our small spaces would function as their guesthouses before they built their main house, only later to order another small space, instead of building a large home on site. The flexibility of the farmhouse style home is great for adding additional living space. We can do this in a number of ways. By adding a simple deck and porch to another space, we can create a dogtrot. An L-shaped add-on is easy to roof and can create great porch space. Adding a breezeway to another bedroom is easy to join roofs and offers more conditioned space. We have used this type of add-on for many purposes including additional sleeping areas, a study, a dining room, and even the dog's sleeping area. All the windows are door height, so we can easily replace a window with a door opening. White – white, white, white. This Little House will be a clean, white canvas. It will be simple and elegant with a dressing of pure white barn wood accented only by the black frames of the windows and doors. The barn wood was reclaimed from a very old barn with a storied past. Originally the barn was a whiskey refinery built in the 1830's in Rumsey Kentucky. It was massive, built with 12"x12" pine post, 2" thick oak floors, and 2"x12" cypress beams, rafters, and framing. It was taken down and re-built as a grain storage barn outside Rumsey in the 1870's where it stood until 2017. It became outdated, unsafe, and needed to be replaced, or as we like to say, it needed to be de-constructed. The simple farmhouse design has stood the test of time. It has been used for many years, withstood many storms, and almost two centuries of building styles. I have found and salvaged many farmhouses dating back to the 1850's and even the 1830's. They have always been small, well built, and weathered well. I love collaboration and enjoy a breathe of fresh air it brings. And that is exactly what our partnership with Stone & Acre represents. Their team has a unique way of spotting a winner from a mile away, and the innate ability to whisper to homes. They hear their voices and can always spot the happy ones. Combine this with their attention to detail and keen sense of style, and they are a true force to be reckoned with. We are so excited about this project and believe there is nothing more romantically Southern than looking across a green pasture studded with live oaks with a blue sky backdrop, and seeing a simple white farmhouse on the horizon. Be sure to check back and follow along as we post our progress in hand crafting this unique space. To learn more about Stone and Acre Real Estate, visit stoneandacrerealestate.com. We can't wait to show you how The Little House is coming along. Modular cabins in Texas? Yes, they work great for remote living needs. Site building can take forever to complete while modular cabins can be built quickly and relatively pain-free. Compared to site building, modular building is much quicker, requires a lot less energy, often times they are built better with more controls and oversight, and they are more flexible. Building in remote locations can be difficult. The never-ending drive back and forth to the site. Every sub-contractor needs directions and possibly needs to be lead onto the ranch to find the actual build site. Every time the electrician has a question someone, usually the home owner, will have to drive to the site to discuss. Driving to the lumber yard for the forgotten 2x4 takes more time, more fuel, and personal energy. I started to build a cabin on my ranch, I had all the material in a container, and the site picked. Then I began to worry about how many weekends it would take me to "dry-in", how many times to meet sub-contractors, how many trips to the store, and realized it would be so much easier to make the trip once, with a complete cabin, built close to home. Inside our build facility, loading a 14x28 model for delivery. When we build a modular home/cabin we typically visit the site 2 times before delivery, once for the initial consultation and site selection, and another time for final location and delivery route. All of our sub-contractors know where our build facility is located, they can easily send crews out to work without worrying about someone getting lost or stuck in a pasture. All sub-contractors are supervised in a controlled environment. We are available for all design and building questions, our office is within shouting distance of our build facility, we can consult within minutes, in person, at the building. This saves innumerable mistakes and time. Because we are on site, we are able to do more quality inspections and make quicker design changes with better understanding. A typical modular build takes 1 month to design (if needed) and under 2 months to complete. A site built home may take 6+ months to build, it will be exposed to all weather elements, and will have minimal oversight. We are able to build our homes on a clean concrete slab with a roof to shade and protect our men and materials. Ask any sub-contractor and they will assuredly tell you they would prefer to build under a roof than on an open field. The home would prefer to be built in a protected area as well, less environmental damage, and less concern about theft. Modular building prevents damage to your site. The facility can easily handle all the trash and construction debris and dispose or recycle it properly. Because there is minimal site work associated with modular building, there will not be a huge mud pit around your home full of nails and plastic. Another advantage, much less traffic on your land, you will not have to repair your roads after the construction is finished. There is no concern about who is on your property and when they may be out there. The biggest advantage of a modular home over a site built home is it can be re-located. There are several reasons to move one, if it is a guest home that is sitting on the best location for the main house, if you change hunting leases, if you want sell it and keep the land, if you want to check out different potential building sites, and if you want to give it to your next generation. I also love not having all the concrete to worry about; removing concrete is costly. Our modular homes are pier and beam, wooden floors, and have a crawl space big enough for a person to do any needed mechanical, electrical, or plumbing repairs or additions. When it comes to remote living needs, modular building seems to check off all the needs, wants, and requirements. It may cost a little more than a site built home, that is if you can find a qualified builder in your area, but the time that you save not having to drive so much, and the superior quality of construction makes up for the difference. I have noticed an increased social interest in Tiny Houses that made me think about some advantages and disadvantages of Tiny vs Small. My general assumption is that a Tiny House is @200sq.ft. or smaller, and probably on wheels. While a Small house is larger 200-1200sq ft. and sits on a foundation. The most obvious advantage to a tiny on wheels is the mobility they offer. Wheels under a house, how convenient if you plan to move it. I see stunning photos of tiny houses in the most beautiful settings but have yet to see one trucking down the road. I think most units find a good nest and stay put. So the mobility advantage could become a stability concern once your bird has landed in it's nest. Stabilizers, blocking, and wheel coverings are typically used to eliminate the "RV shake" and dress up your ride. I am always amazed by how many clever nooks and storage areas a person can create. Tinys tend to have lofts, which are cool but not always practical. Lofts make Tinys taller and less road-worthy. I am not a fan of the disproportionate heights some can grow. Seems to negate the advantages to being mobile, they struggle with crosswinds, height restrictions, and can have a general awkwardness of proportions that steal any hope of a true house-like appearance. No one wants to look like the Beverly Hillbillies rolling into town. Proportion and design is as important as functionality and cost savings. Most people assume a tiny house is affordable, I always say, it is, if you DIY it. I have tried to price Tiny houses with the needed amenities and have always struggled to meet Tiny budgets. The amount of MEP (mechanical, electrical, plumbing) required is the same as a Small home. The only cost difference is the amount of building material they require. Trailers are not cheap and usually require modifications that can be costly. To achieve tiny budget costing, the fixture and finish budget is always sacrificed. This usually means RV quality fixtures not installed by a pro. Once you trim quality from the project your home is quickly susceptible to depreciation. How many used Tinys have sold for anywhere close to their construction cost? None that I know. One thing I really like about Tinys, is how many young people I see building their own. For first time home owners, building a tiny is a great solution to today's rising entry home cost. It also gives invaluable experience in understanding construction principals and even real estate development. Some obvious advantages small homes have over Tinys. Permanent foundation, more space=more livable, transportable vs mobile, and they have a more traditional home appearance. Small homes tend to be finished with more stable foundations, set on piers or stem walls, some keep the skids and just block the corners (not preferred). They have a more "grounded" feel with less shake, and are less likely to be blown over in high winds. The larger footprint allows for more traditional uses of space, less lofts and more dedicated bedrooms. Small houses have larger more equipped kitchens than Tinys. If you want to have interior space to entertain, Smalls always win. They have more opportunity for access to outdoor space. Most Tinys have only one entrance, maybe because they are on a trailer. Trailers are limited by weight on the amount of deck space a trailer can move. Even though this is in one of our smaller Reclaimed Spaces, this kitchen is complete and very usable. Interior of a small modular home by Reclaimed Space with a baby grand piano and seven foot sofa. Transportable vs. mobile is an article by its self. A well built Small house can be moved many times, I shipped one from Austin to California, back to Austin, and then to a site overlooking the F-1 track. Another one was moved a total of 6 times in 2 years, both houses made it safely and had no structural or cosmetic issues or concerns.The cost to build a small is fractionally more than a tiny. Smalls do not require the purchase and modification of a trailer. This savings can be spent on foundation blocking, an eventual move or the needed move from the building location. My experience has shown me, that often times, Smalls are built better than Tinys. I find that most Smalls are constructed using industry standard materials and principals by licensed and insured MEP contractors. I say that because all the Tinys I have personally seen built were done completely by DIYers and their friends. My preference is to build Small unless you see your home moving more than 6 times in the next 10 yrs. When you decide to build, always budget for licenced and insured MEP contractors for a longer house life expectancy. And remember, you are not "stuck" with a Small, it can be sold, it can become your guest home, mother-in-law, or be moved to your next hunting/land lease or purchased land. These are just my thoughts, what do you think? Hello, and welcome to our very first blog post! This is an exciting time for us to be able to share with all of you our knowledge and day to day tasks that we do here at Reclaimed Space. In addition to learning about Reclaimed Space, we hope to provide you with valuable information about sustainability, off-grid living and design. We hope you will find this blog both helpful and enjoyable! Let's get started with a formal introduction! 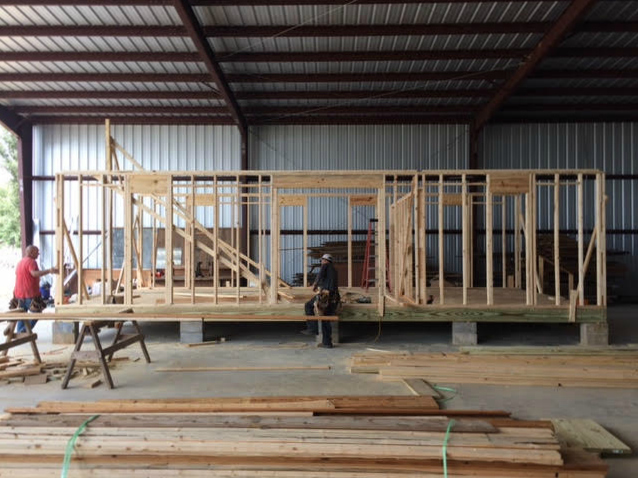 Reclaimed Space is a custom modular home builder located in the heart of Texas (Lockhart, Texas to be exact). We've been in the business for over nine years, and have loved every moment of our time reclaiming and building cabins for clients all across the country. From studio spaces to commercial buildings, Reclaimed Space can build almost anything just for you! Founded by rancher and environmentalist, Tracen Gardner, Reclaimed Space began its humble beginnings from its mother company DIRTCO Construction. What began in 2007 as a unique project, eventually blossomed into the Reclaimed Space you see today. What we do is simple. 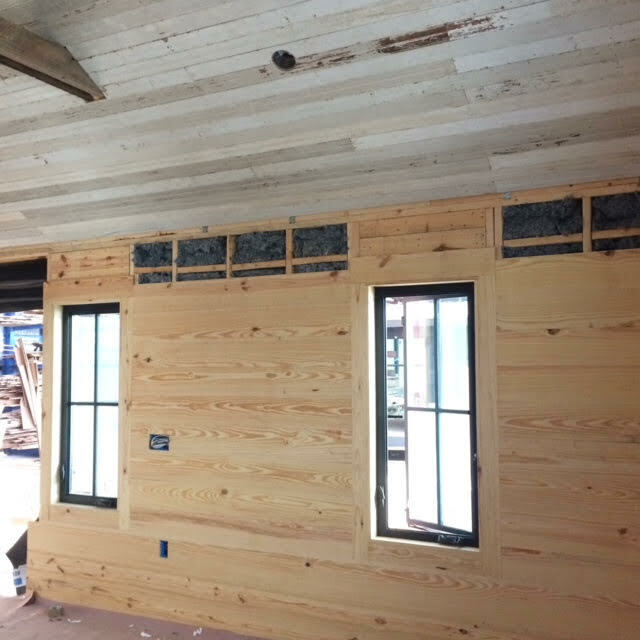 We purchase, and or salvage, reclaimed materials such as barn wood, corrugated metal, shiplap, flooring and beadboard and use these materials to create had crafted modular structures that can be delivered anywhere in the United States. We'll talk more about how we salvage these materials and where you can find reclaimed materials of your own in future blog posts. Until next time!